When the B&B Carousell reopens in Coney Island next season, the restored 1919 ride will spin in a glass pavilion next to the Parachute Jump. The progress of construction on the pavilion and its new home Steeplechase Plaza can be seen in the above photo. Large-scale neon lettering spelling B&B CAROUSELL will encircle the top of the completed pavilion. Coney Island’s last hand-carved carousel was saved from auction in 2005 when the City purchased it for $1.8 million from the McCullough family who operated it on the north side of Surf Avenue since the 1970s. The Parachute Jump, the sole survivor of Steeplechase Park, is also a focal point of Steeplechase Plaza. The red, yellow and blue sheet metal panels and medallions at the base of the Jump are getting a redo as you can see in the photo below. 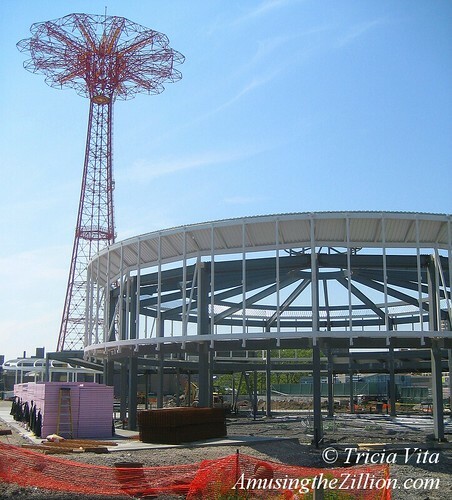 Besides, Coney Island is getting a 2.2 acre public plaza on the old Steeplechase site, not a new Steeplechase Park. 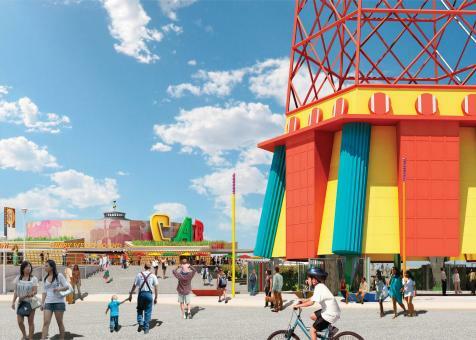 According to the NYCEDC’s press release issued at the time of last November’s groundbreaking, the plaza will be the western gateway to the revitalized Coney Island and will be large enough to host a variety of events. For the first time, visitors will be able to walk directly underneath the Parachute Jump and gaze up at the latticework structure from the inside. 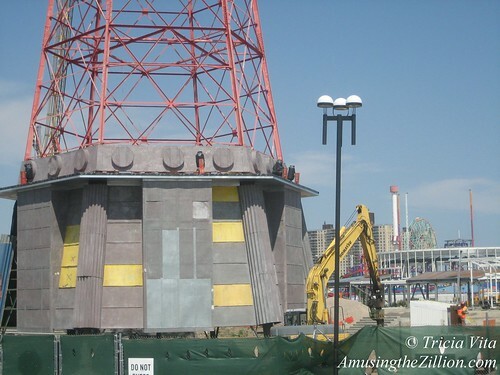 The landmark will also get a new lighting scheme to “bring the bling to Coney Island,” in the words of Brooklyn Borough President Marty Markowitz. Oh Fiddle Sticks!! Who wants to walk underneath it and gaze at the the lattice work? What a waste of time and energy. If they are dangerously flying people over the boardwalk, they should be able to restore this magnificent thrill ride back into operation. Every thrill ride cost money to operate and they all have liabilities. They should really incorporate more thrill rides along with the events at this so called new Steeplechase Pavilion. And yes, it is a big dissappointment for many, many people. The B&B Carousell is really the only good outcome out of this whole project. And why not have called it a new Steeplechase Park?